Once upon a time, there lived a little angel who in order to get his wings had to do a good deed. However, it was much too naughty to do so! One night since these days there was no sun but only the moon, he secretly took a little witch’s magic broom and started sweeping the sky, aiming to clean it, so that he could finally earn his golden wings. 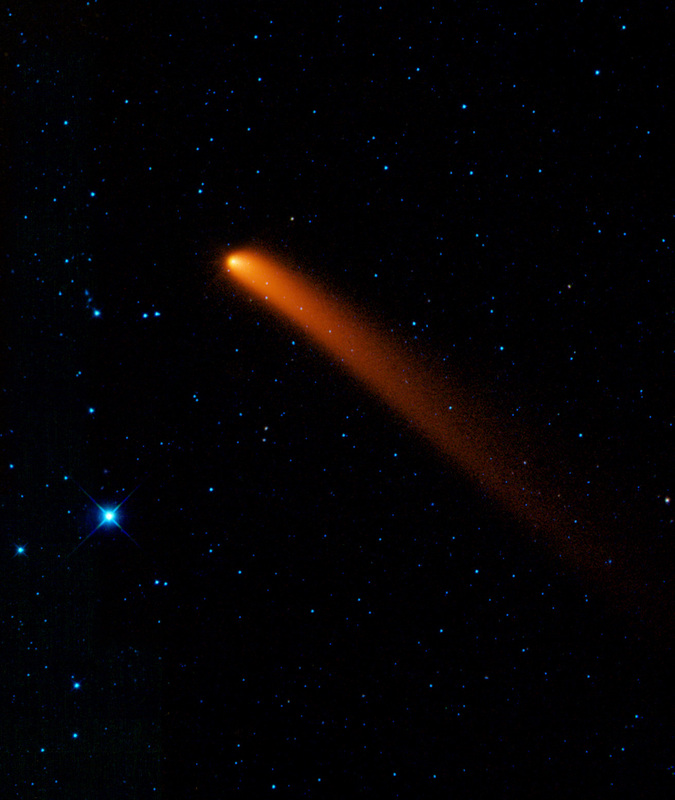 While sweeping, he saw a comet in a corner of the sky, a comet who was asleep lying on a giant tail made of star dust. “My, my! How filthy”, the little angel thought. “The poor comet is far too tired to clean up all this terrible dust he gathered from all his journeys. This is beyond a doubt a job for the super little angel! Immediately, he raised his huge sleeves and furiously started gathering the star dust. In a blink of an eye there was not even a speck of dust left. Tired but content because of his good deed, the angel went to sleep. In the meantime, the comet woke up full of joy and power to continue his endless journey in the far away galaxies. He stretched, moved his body and took off. He took a step forward, but nothing! He couldn’t leave! Utterly surprised, he turned around, to see what was going on… What a disaster. His huge tail of star dust which he took such pride on … was missing. It just wasn’t there! He felt miserable and hot star tears were pairing from his dark eyes. The little angel woke up and went to the supervisor of the star system to declare his good deed and to receive his wings. The supervisor told him off for his recklessness and he hid shamefully under a cloud. The comet was filled with despair. The supervisor went to his closet and found a beautiful ring. He placed it around the comet’s waist and turned him into a planet. In fact, he also gave him the beautiful name “Saturn”. “Mm! That’s not so bad” the comet-planet thought to himself. To be honest, I grew tired of wandering without a cause from galaxy to galaxy all these years. The time went by and the little angel, not having learnt his lesson, kept pondering what good deed he could do to finally earn his wings and be done with this. While he was wandering talking to himself, he saw a big star shivering from the cold. Our little angel felt sorry for it and decided to knit it a warm sweater, so that it wouldn’t be cold. He immediately took threads from the moon and full of excitement began knitting his star sweater. In a matter of hours it was ready. He gently took it on in his arms and filled with joy went to the star to give it to him. “Are you sure nothing will happen to me if I wear it?” the big star asked dubitably. The star began to feel quite hot and it began turning yellow, red, orange. This heavenly knitwear turned into flaming tongue that wrapped its body and it started glowing, glowing so much that the whole word was illuminated. The little angel went crazy with fear and with tears in his eyes, run to the supervisor. The supervisor swiftly ran to the hot little star. Once he got there, he was lost for words. The little star was so bright and warm that the whole word was covered in sweet warmth. The flowers had blossomed and the birds were singing for the first time. As for the star, not only was it not burning anymore, but it was proud of his glow. “Don’t be afraid”, said the supervisor, “I’ll turn you back into a small star”. “No, I don’t want to, I like the way I am. Can’t you see? Everything is warm and nice”. The supervisor got the regulations out of his pocket and found the solution on the fifth page. “Here it is”, he screamed! “I’ll let you walk in the sky for a few hours, then you’ll go to sleep and the rest of the stars, always led by the moon will illuminate the sky”. That was how daytime and nighttime were born. The star was very happy. After all, it’s not a small thing for a star to shed light on the whole sky. In his debt, the star asked the planet supervisor to give the angel his so longed wings because with his naughtiness he had turned it into the brightest star. The supervisor gave the angel two beautiful golden wings and named the star “Sun”! Since then the two of them have become inseparable friends to such a degree, that if you carefully look at the sun you’ll see a little angel with two golden wings flying happily around it. BIO: Nick is sixteen years old and is from Heraklion, Crete of Greece. he writes poetry and fairytale.